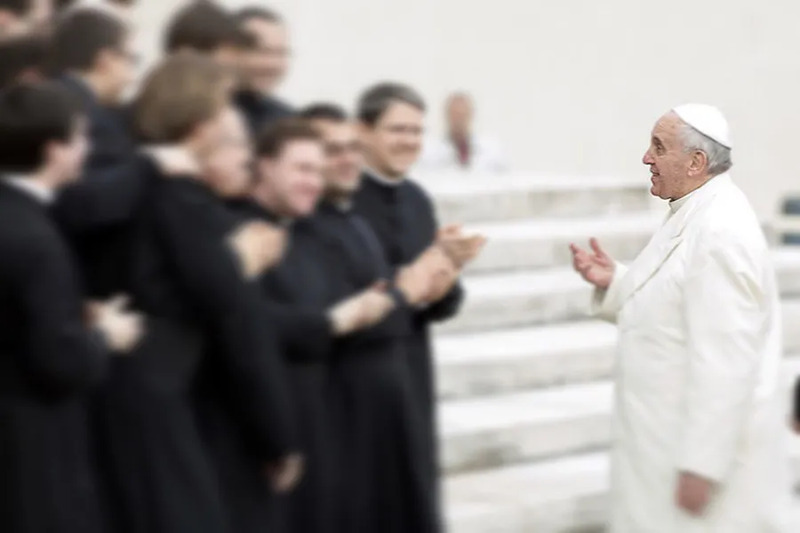 Vatican City, Feb 16, 2018 / 07:38 am (CNA/EWTN News).- On Friday Pope Francis met with the community of the Pontifical Maronite College, explaining how their seminary formation isn’t about them or even for them, but for the people they will eventually serve in their parishes and dioceses. “It is by drawing on these pure sources that your ministry will be good water for today’s thirsty people,” he explained. 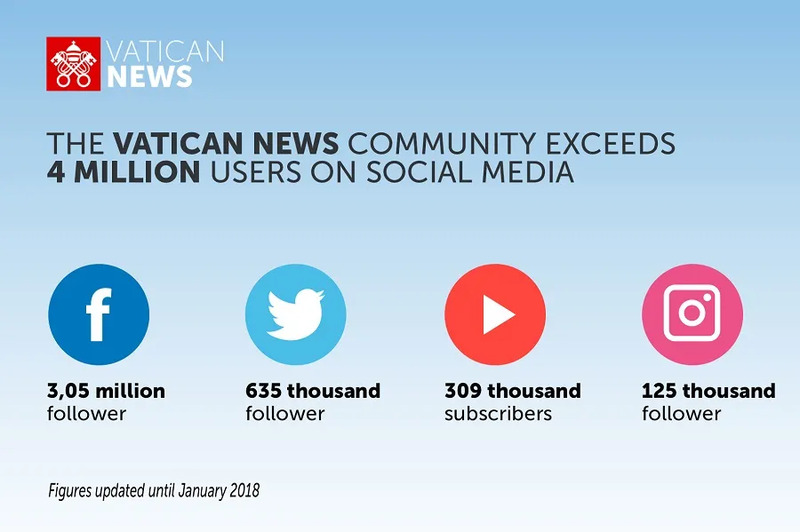 Vatican City, Jan 9, 2018 / 04:51 am (CNA/EWTN News).- After the recent re-branding and consolidation of the Vatican’s various media outlets, their different platforms have now reached a total of more than 4 million followers, who receive their daily papal news with a fresh logo. In order map out what a possible reform of Vatican communications would look like, the Pope in 2014 established an international commission headed by British Lord Chris Patten to study the current process and provide suggestions. The secretariat oversees all of the Vatican’s communications offices, including Vatican Radio, L’Osservatore Romano, the Vatican Television Center, the Holy See Press Office, the Pontifical Council for Social Communications, Vatican Internet Service, the Vatican Typography office, the Vatican’s Photography Service, and the Vatican publishing house. During the Council of Cardinals’ most recent meeting in December, Vigano unveiled the new logo and design for the Vatican News website, which consolidated the Vatican’s former news and radio pages into a new multimedia hub, which features audio, text, video and graphics, available in multiple languages. With the consolidation of their social media pages, the Vatican has seen a sharp increase in followers in recent months. On Facebook specifically, their page “Vatican News” – recognizable by the new insignia, which is a white Vatican logo with a red background – has more than 3 million followers. The Vatican’s YouTube channel, which offers viewers live coverage of the Pope’s activities, has also been rebranded with the same new logo and given the “Vatican News” title. Social media for Vatican News is managed by the Secretariat for Communications’ Editorial and Theological-Pastoral departments. The secretariat also manages the Pope’s social media accounts in collaboration with the Secretariat of State. Vatican City, Aug 21, 2017 / 04:11 pm (CNA/EWTN News).- As he arrived to Russia for his official three-day visit, Vatican Secretary of State Cardinal Pietro Parolin said the Holy See has a special role on the global scene given its attention to both spiritual and diplomatic themes. 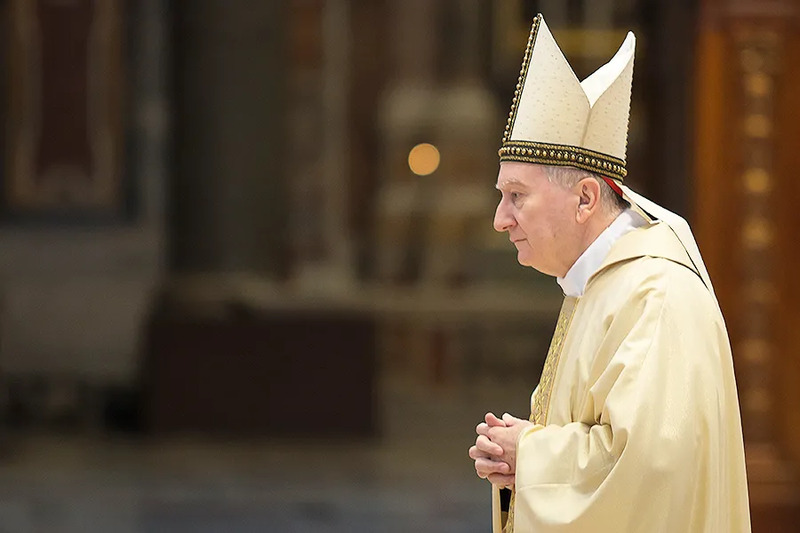 Cardinal Parolin spoke to TASS the day before his official Aug. 21-24 visit to Russia, during which he is set to meet with several heavy-hitters including Patriarch Kirill, Russian President Vladimir Putin, and several other high-level members of the Russian Orthodox Church. The interview touched not only on the Holy See’s diplomatic task, but it also focused largely on relations between the Catholic and Russian Orthodox Churches, specifically in terms of preserving traditional Christian values. Parolin also spoke of U.S. President Donald Trump’s policies so far during his brief tenure, and the ongoing crisis in Venezuela. Traveling with Parolin as part of his official delegation is Msgr. Visvaldas Kulbokas, adviser to the apostolic nunciature of Russia and an official in the Relations with States section of the Vatican’s Secretariat of State. On Aug. 21, the first day of this visit, Parolin met with the Catholic cardinals and bishops of Russia, and in the evening presided over Mass at the Cathedral of the Immaculate Conception in Moscow, after which he held a friendly encounter with clergy and the laity. He also met with Metropolitan Hilarion of Volokolamsk, President of the Department for External Relations of the Moscow Patriarchate. Tomorrow morning, Aug. 22, is dedicated to a working session with Russia’s Minister of Foreign Affairs, Sergey Lavrov, while in the evening Parolin will meet with Patriarch Kirill, and will hold a brief press conference afterward. On Wednesday, Aug. 23, the last day of his visit, Cardinal Parolin will head to Sochi for his official meeting with President Putin. No other official meetings are on the schedule before the cardinal returns to Rome Aug. 24. In his interview with TASS, Cardinal Parolin said the Vatican has been “working on the idea of the visit to Russia for a long time,” and that it is finally possible largely as a result of the February 2016 meeting between Pope Francis and Kirill. It’s not just about preserving values so much as “the very concept of human personality and human dignity,” he said, pointing to the specific challenges presented by showing respect for humanity and his work, striving for social justice, interpersonal relations and relations among States. Pointing to the Catholic Church’s decision to “loan” relics of the well-loved Orthodox Saint Nicholas, consisting of several bone fragments currently housed in Bari, to Russia over the summer, Parolin said the gesture served as a “spiritual uplift” of sorts for the Russian Orthodox Church. “There is no doubt that this event and other similar initiatives, which can be called the ‘ecumenism of the saints,’ give an opportunity to fully feel what already unites Christians,” he said. The relics were sent from Bari to the Cathedral of Christ the Savior in Moscow from May 22-July 12, and were venerated by President Putin and thousands of Orthodox faithful. Not only was the event important for the spiritual life of believers, but it also served as an example for future initiatives and gave “a new impetus” to dialogue on “more complex” issues in Church relations, he said. Asked about some of U.S. President Donald Trump’s controversial policies since taking office, including his decision to pull out of the 2016 Paris Climate agreement, and what the Vatican expects from Trump, Parolin voiced hope that the two States can move forward in mutual respect. The meeting in May between Pope Francis and Trump “was held in the atmosphere of mutual respect and I would say, with mutual sincerity” in which both men were able to voice their thoughts and concerns.